The toes provide a major function in creating stability of the foot during walking. The primary movement of the toes is flexion or bending down and extension bending up during the walking cycle. Toe anatomy consists of three bones or phalanges in the second, third and fourth toes and generally two bones in the first or big toe and fifth toe. The phalanges are the attachments sites for six separate muscles that have their origination in the leg or the foot. The long flexor and extensor muscles originating in the leg and the short flexor and extensor muscles originating in the foot normally balance each other to provide the toe stability during walking. Lumbrical and innerosseous muscles also attach to the toe. If muscular imbalance occurs between the extensor and flexor muscles the development of a hammertoe will occur. A hammertoe is a flexion contracture of the toe with the bending occurring at the proximal interphalangeal joint of the toe. Excessive firing of the flexor muscle group as opposed to the extensor muscle groups will cause this deformity. 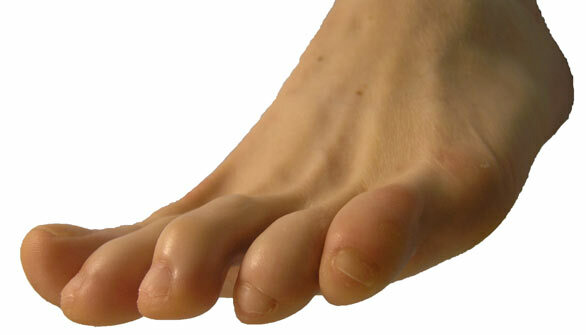 Pain associated with the hammertoe deformity often occurs at the areas of increased pressure and friction. The top of the toe at the proximal interphalangeal joint can contact the upper portion of the shoe toe box which over time can develop a painful corn or callous. The tip of the toe will contact the ground on the surface of the sole in the shoe and cause the development of a painful callous. Treatment for hammertoes should be directed to the site of pain. The pain associated with hammertoes often is related to friction for the surface of the shoe. It is important to wear a shoe with soft upper materials and one that has adequate width and depth to accommodate the foot. Pain occurring from callus between the toes can be relieved by products such as lambs wool, foam or silicone pads that help to relieve the pressure. Remember that it is important to not place the pads directly over the area of pain because this increases pressure. The pads need to relieve the pressure by increasing pressure to the surrounding tissues. Painful callus at the tips of the toes can be relieved with the use of a crest pad which transfers the ground pressure away from the tip of the toe. Reducing the thickness of the painful corn or callus can be performed by using topical corn or callus remover agents or by using commercially available callous reducing tools. Safety and medical supervision or generally recommended to prevent inadvertent skin injury. Surgical care of hammertoes can be pursued if failure of conservative measures. 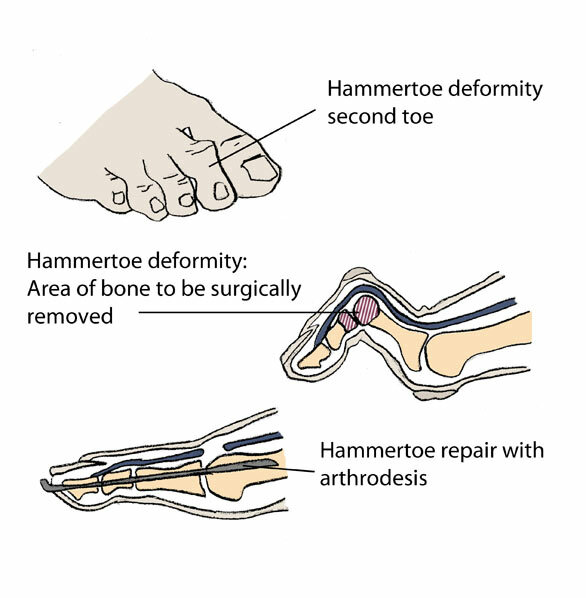 There are many different surgical approaches to correcting a hammertoe deformity. The selection of surgical procedures are oftentimes based on which toe is involved, whether the toe is in a rigid or flexible flexed position, and whether or not there is contracture at the metatarsalphalangeal joints. The joint resection arthroplasty is the most common type of hammertoe repair. This procedure removes the head of the proximal phalanx which will help straighten the toe and reduce the pressure on the top and end of the toe. Proximal interphalangeal joint arthrodesis is a procedure that removes the cartilage at the joint surfaces of the involved toe. The phalanges are placed together making bone to bone contact and then stabilized often times with a pin for a period of four to five weeks. The bone to bone interface and the stabilization of this arthrodesis will encourage the bones to heel together. This procedure creates greater stability of the joints of the toes by creating a rigid toe at the involved joint. The joint arthroplasty and joint arthrodesis procedures are often performed with additional soft tissue or bony procedures that help maintain the normal toe position. The soft tissue procedures include releasing the tight joint capsule of the metatarsalphalangeal joint, or capsulotomy, with lengthening of the extensor tendon as well as the possible use of the flexor tendon transfer which shifts the pull of the flexor tendons to help hold the toe on the ground. The surgical care is generally performed in an outpatient surgery center with local anesthesia and anesthesiologist monitored sedation. Most patients will walk the same day using a post surgical shoe and without the use of crutches. Patients often return to normal shoe gear between two and five weeks after surgery depending on the type of hammertoe repair that was performed. The pain associated with hammertoe deformity occurs generally at the top of the toe related to friction from the toe box of the shoe or at the tip of the toe related to friction and pressure from the sole of the shoe or ground. 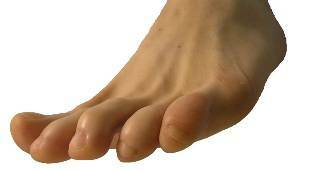 Hammertoe surgery restores more normal anatomy and by straightening the toe creates more normal friction pressures on the toe thus relieving pain. 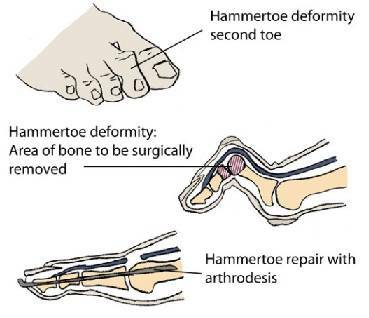 Biomechanical implications of hammertoe deformities. 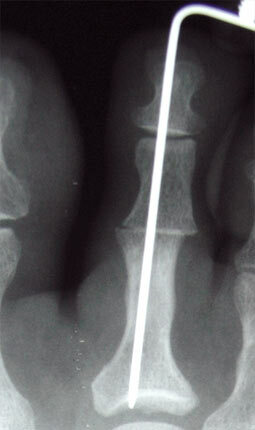 Peg and dowel fusion of the proximal interphalangeal joint. This Crest or Splint is made of high-comfort chamois leather, that gently straightens one to five hammertoes, with each step you take. This alleviates your pain in the top or tip of the toe. It will also exercise the toes as you walk, preventing them from becoming worse, and more unsightly. Kerasal Professional Exfoliating Moisturizing Foot Ointment is an extra-strength formula available from podiatrists only. Our latest innovation, it offers highly effective ingredients that repair severely cracked heels and soften even the roughest, driest feet. The dual action formula both exfoliates and moisturizes in one step. Hands & Feet Pumice Sponge is the hygienic way to soften, exfoliate, and clean skin. The unique shape smoothes away hard skin on feet, heels, toes, hands, and elbows. The warmer the water, the gentlerthe sponge becomes, so it can be used on delicate areas. Soft gel cushions corns, calluses, bunions, blisters and abrasion; washable and reusable, five sizes included.